But there’s an important difference. Veggielution is a community farm that’s centered on people, not profit, and they’re utilizing food and farming to build a positive community in East San José. Founded in 2008, Veggielution operates a 6-acre urban farm at Emma Prusch Farm Park in the Mayfair neighborhood of Silicon Valley. Their mission is to connect people from diverse backgrounds and offer training, education, and leadership development through food-centered programs. The farm is the heart of Veggielution’s community. But in addition to working with people and hands-on farming, the success of Veggielution relies on behind-the-scenes operations including outreach, volunteer work, sponsorships… and a lot of paperwork. To that end, Veggielution needed a local workspace where they could get things done in a quiet and productive environment, and All Good Work stepped in to help plow the way. 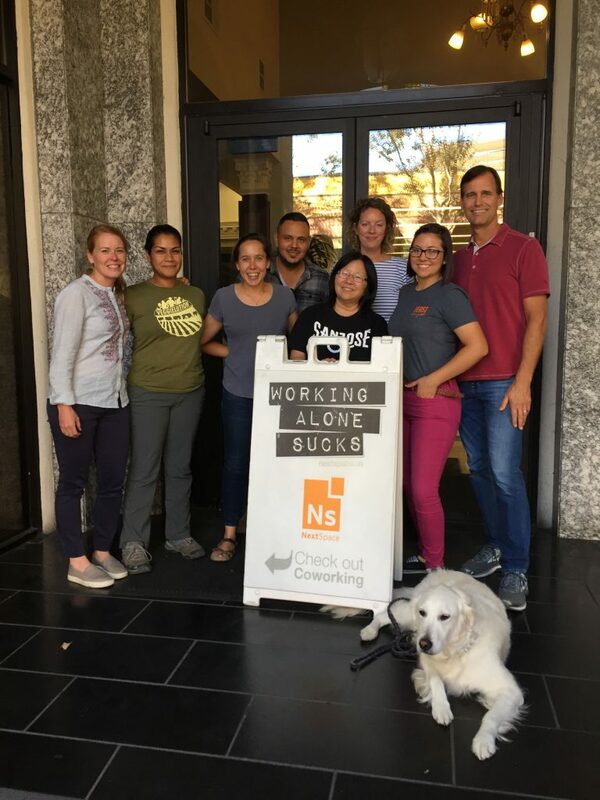 Through the All Good Work program and the positive contribution of our newest Host — NextSpace Powered by Pacific Workplaces — the Veggielution team is now happily enrolled at NextSpace on Second Street, San José, just 3 miles from the farm. For Hill, like so many others who run nonprofit organizations, choosing where to place their financial investment is a difficult decision. This isn’t just great news for the Veggielution team — it’s also an exciting step forward for the All Good Work Foundation. Pacific Workplaces marks our first step into Silicon Valley and a significant expansion for the Foundation, which until now has mostly operated in New York. Of course, none of this would be possible without the generosity of workspace Hosts like NextSpace Powered by Pacific Workplaces. Thanks to our Hosts, All Good Work is able to connect the dots and help nonprofit organizations by placing them into local coworking communities, where they can get the support and infrastructure they need to follow their vision without the financial burden of an office lease. But it’s not just nonprofit Residents that benefit. Keith added: “Through this connection we’re not only giving back to organizations that need a helping hand, we’re also making a positive difference by bringing in people who want to become an active part in our community. You can learn more about Veggielution and how they’re building bridges within the local community at veggielution.org. If you’re interested in applying to join All Good Work as a Resident or a workspace Host, contact our team today — we’d love to welcome you onboard! The Veggielution team at their San José coworking space. Cayce Hill of Veggielution (left) with Keith Warner of NextSpace Powered by Pacific Workplaces (right).